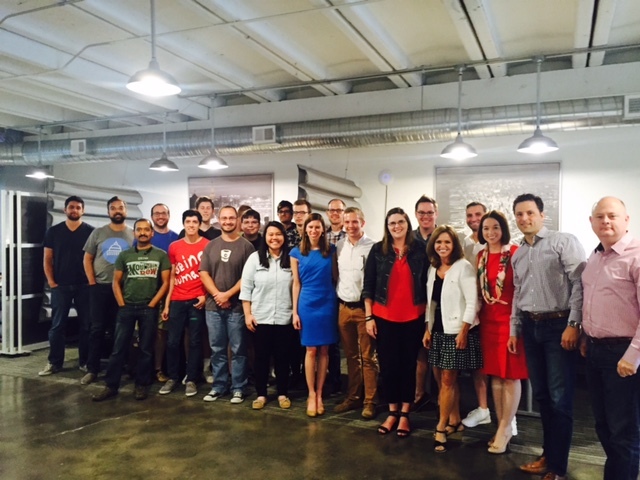 On June 29, 2016, U.S. Rep. Lynn Jenkins (KS-02), the fifth-highest-ranking member of House Republican leadership and a member of the U.S. Ways and Means Committee, toured Kansas City startup PayIt. PayIt is a cloud-based mobile solutions platform for government, leveraging its technology and insights to rewrite and automate the citizen engagement experience. PayIt’s patent-pending mobile platform brings speed and simplicity to the citizen-government payment processing experience for state and local services, such as the DMV, permits and licensing, turnpike passes, income tax, traffic citations and more. Kansas Transportation Authority recently deployed the PayIt Kansas mobile app, providing K-TAG account users the ability to access and manage their K-TAG account anytime, anywhere, directly from their smartphones. The visit was an opportunity to showcase to Rep. Jenkins how the New Markets Tax Credit (NMTC) program facilitates financing for a variety of businesses and projects, from housing developments to community centers to manufacturing plants, located in states and communities that are underserved by traditional sources of capital. A member of Kansas City’s thriving technology start-up community, PayIt’s rapid growth also reflects the area’s strong tech talent and entrepreneurial spirit. NMTC financing for the project was provided by Advantage Capital Partners.